In Dave Arnold s world, the shape of an ice cube, the sugars and acids in an apple, and the bubbles in a bottle of champagne are all ingredients to be measured, tested, and tweaked. With Liquid Intelligence , the creative force at work in Booker & Dax, New York City s high-tech bar, brings readers behind the counter and into the lab. There, Arnold and his collaborators investigate temperature, carbonation, sugar concentration, and acidity in search of ways to enhance classic cocktails and invent new ones that revolutionize your expectations about what a drink can look and taste like. Years of rigorous experimentation and study botched attempts and inspired solutions have yielded the recipes and techniques found in these pages. Featuring more than 120 recipes and nearly 450 color photographs, Liquid Intelligence begins with the simple how ice forms and how to make crystal-clear cubes in your own freezer and then progresses into advanced techniques like clarifying cloudy lime juice with enzymes, nitro-muddling fresh basil to prevent browning, and infusing vodka with coffee, orange, or peppercorns. Practical tips for preparing drinks by the pitcher, making homemade sodas, and building a specialized bar in your own home are exactly what drink enthusiasts need to know. For devotees seeking the cutting edge, chapters on liquid nitrogen, chitosan/gellan washing, and the applications of a centrifuge expand the boundaries of traditional cocktail craft. Arnold s book is the beginning of a new method of making drinks, a problem-solving approach grounded in attentive observation and creative techniques. Readers will learn how to extract the sweet flavor of peppers without the spice, why bottling certain drinks beforehand beats shaking them at the bar, and why quinine powder and succinic acid lead to the perfect gin and tonic. Liquid Intelligence is about satisfying your curiosity and refining your technique, from red-hot pokers to the elegance of an old-fashioned. 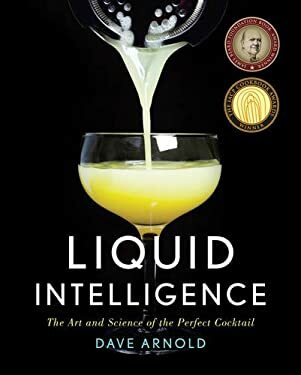 Whether you re in search of astounding drinks or a one-of-a-kind journey into the next generation of cocktail making, Liquid Intelligence is the ultimate standard one that no bartender or drink enthusiast should be without. "